Bring works of art to life by creating this DIY Coloring Robotic Spider using the HEXBUG Spider! Complete this DIY activity for kids using products you already have at home! Colder temps are here to stay, but there’s still plenty to keep your kiddo busy indoors! Spice up coloring time with this DIY Coloring HEXBUG Spider! This super easy DIY can be done using materials you already have around the house and is so easy that it’s appropriate for younger children. Challenge their brain and their creativity with this fun coloring challenge! Make sure your HEXBUG Spider is turned off, then choose 6 markers of any color to use for your artwork. Get creative with your color choices! Pull 6 pieces of tape, approximately 3 inches in length, from the tape dispenser and set aside. Select a marker and align the tip with the tip of the Spider leg, then tape the maker to the leg. Repeat step 3 until all legs have a marker attached. 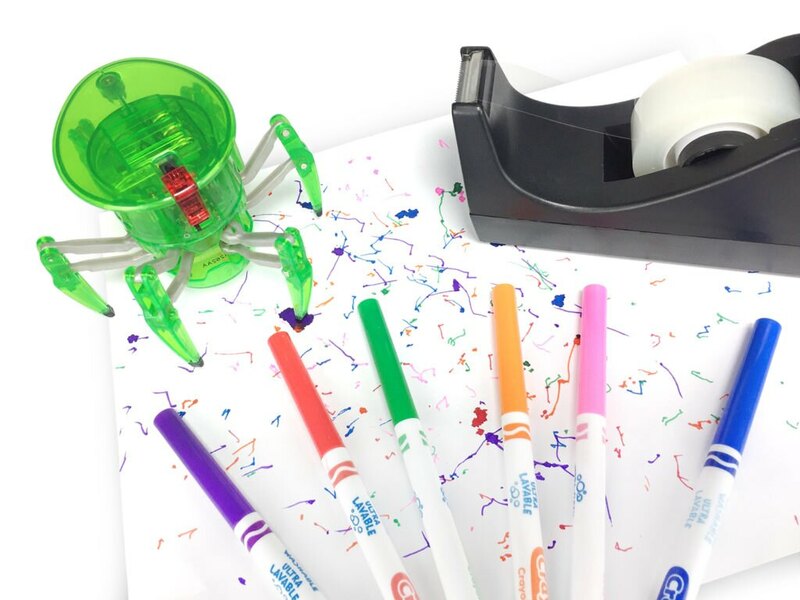 Place the your newly created Coloring Spider onto a piece of paper, poster board, or other coloring surface and turn the Spider on. Use the Spider’s remote control to create your own work of art! Did you and your kiddo complete this DIY? Tag us on Facebook, Twitter, or Instragram @hexbug or use #HEXDIY!